Welcome reception for international delegates attending Avalon - national overview of Australia’s defence sector. Hosted by: Chief of Air Force and Aerospace Australia Ltd. 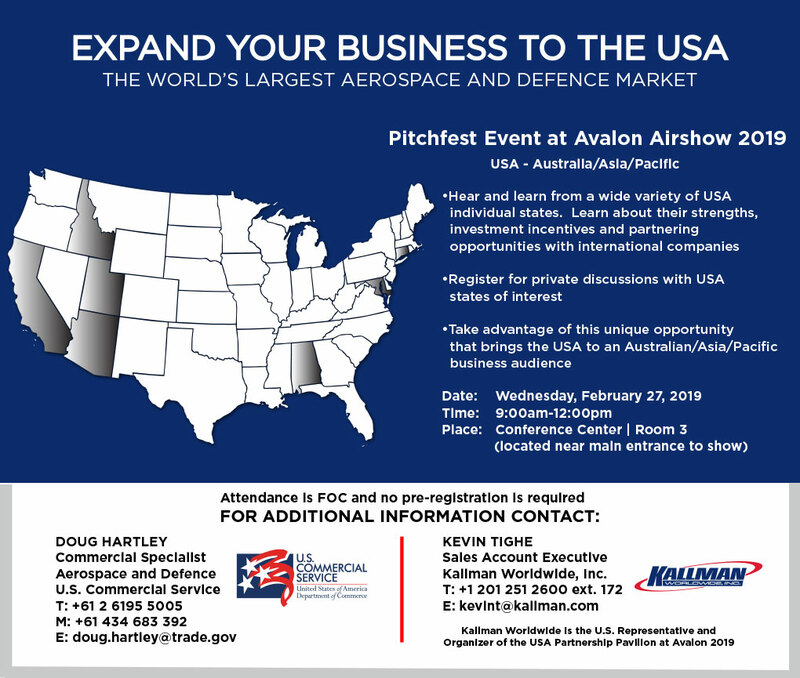 Hosted by: Aerospace Australia Ltd.
Join Kallman Worldwide and distinguished guests for light refreshments and opening remarks followed by the ceremonial ribbon cutting to officially open the USA Partnership Pavilion for business at Avalon 2019. Hosted by: Kallman Worldwide, Inc. Invited U.S. and International distinguished visitors take an escorted tour of the USA Partnership Pavilion. Hosted by: U.S. Commercial Service and Aerospace Australia Ltd. Sponsored by: Kallman Worldwide, Inc.
Be our guest for a night with high-ranking U.S. government officials, international VIPs, and other distinguished guests of honor, back dropped by a beautiful view of the city of Melbourne. For all inquiries regarding the events above, please contact Project Coordinator, Nancy Villari.